On any given Saturday, our Fully Furnished Ministries teams of volunteers wake up early, meet up at 7:30am at our warehouse in Norcross to spend a day serving families in need in our communities. Women, men, children, old and young, weak and strong, gather in the warehouse to first pray. Giving the day to the Lord and His work, the teams start loading up our rental trucks for their delivery stops. On these stops, the “Hands Teams” will go to designated houses/apartments to deliver furniture, kitchen items, linens and more to families who lack the basics in their homes. Meeting these ordinary families, praying with them and blessing them with furniture is the highlight of any Saturday for most of our teams. They have fun, feel refreshed and serve with joy as they bring smiles to so many faces! After the deliveries/drop-offs, our “Hearts Teams” spend time with the receiving families, cultivating relationships and sharing the Truth in love with those open and willing. At the same time, our “Hands Teams” continue their journeys in the trucks, going to homes scheduled for pick-ups. 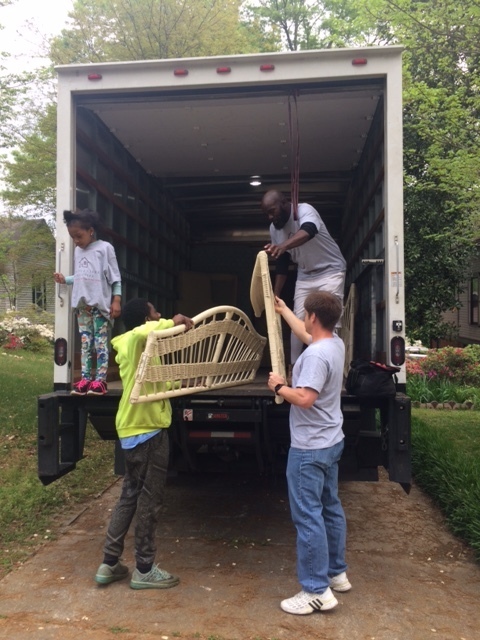 These families are generously donating furniture — this furniture will then be taken back to the warehouse to be assessed, organized and maybe refurbished, before it finds its way to a new home, to bless another family. We are continually amazed at how an ordinary Saturday turns extraordinary through God’s work through Fully Furnished Ministries, the volunteers, families, and furniture. It’s a lot of work, but work that is fruitful! A queen bed, a recliner and a coffee table to a family in Tucker. Join us in praying for these families, for more volunteers, and for more funds to continue to rent trucks and warehouse space to continue our ministry work. If you want to learn more about volunteering, read about our teams here.